Dollar Saving Diva: Rebecca Minkoff Sample Sale Starts Today! Today marks the start of the Rebecca Minkoff sample sale. Though I still don't own a Rebecca Minkoff bag (we'll see how much longer that lasts), I have always been a fan of her classic, but still trendy leather bags. I would say the average Rebecca Minkoff bag normally runs in the $400-$600 range, though the smaller styles are significantly cheaper. Sample sale prices certainly aren't cheap, but you do get a pretty sizable discount. For example, the "Covet" style normally starts at around $400 (and ranges close to $500 depending on material), but at the sample sale, it starts at about $215. The Rebecca Minkoff sample sale usually has a very extensive selection, so if you are a RM fan, you're likely to come out with a shopping bag. The sale runs until Sunday. Hours are 10-7 on weekdays and Saturday, and from 11-5 on Sunday. It's located at 155 Fifth Avenue (near 22nd street). 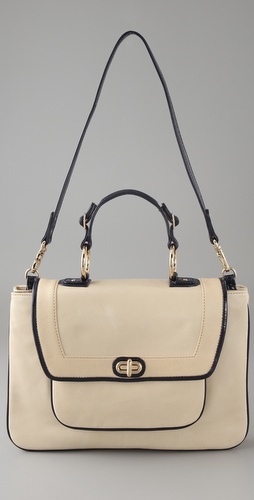 This "Covet" bag, currently $395 on Shopbop, is $217 at the sample sale! Though, you will get 15% off through Shopbop's F&F sale.